Middle Tennessee's Bonnaroo Music & Arts Festival attracted 80,000 fans last year. But overt commercialism (read signage) and music festival don't always mix. So what's a brand to do? Provide an experience that affords them the permission to talk with music fans. This year 28 sponsors will join jam bands and mainstream music acts to gain the favor of 18-34 year olds over the four day event in Manchester, Tennessee. Here's some of the offerings they'll provide in an attempt to add value to the event and make the event "a really good time" -- Bonnaroo's literal french translation. Canon will make its first appearance at Bonnaroo this year. The Photo Pit Powered by Canon will feature live photo shoots of Bonnaroo acts and a lounge where fans can upload, print and share Bonnaroo pics throughout the festival. Canon Paparazzi will also roam the grounds snapping pics. 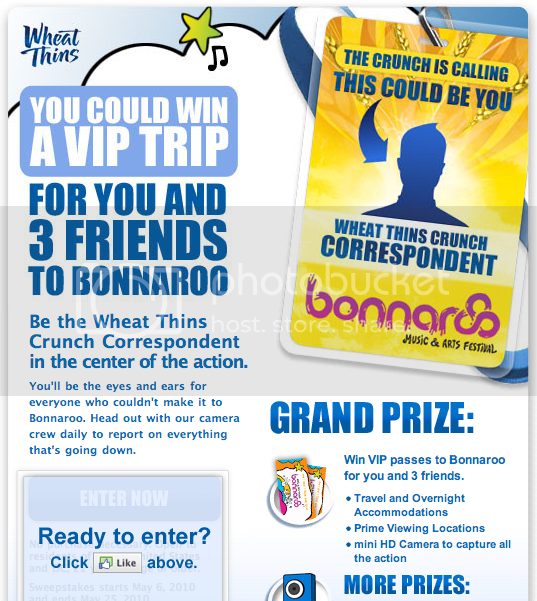 Under the "Crunch is Calling" marketing campaign, Kraft/Nabisco Wheat Thins is offering one fan (and 3 friends) VIP passes and the opportunity to vlog backstage. Fans can enter the contest by becoming a Wheat Thins Facebook fan. The brand will also offer the "Crunch Den" on-site, which will allow fans to upload their personal content via interactive kiosks and video booths. In an effort to promote the flexibility and customizable settings of the 2011 Ford Fiesta, Ford hopes the Fiesta Garage will allow fans a unique way to customize their Roo experience. Fans can participate in artist workshops where they'll meet the bands, screen print their own unique t-shirt designs and win custom records decorating the walls. “Customers are savvy. They want expressive cars that deliver not just great fuel economy, but also high quality, new technologies and a fun driving experience,” said Mark Fields, Ford president of The Americas. A music festival with a beauty salon? Music festivals can be messy so Garnier Fructis (L'Oreal) came up with the idea to offer festival-goers the opportunity to freshen up at the Bonnaroo Salon, going well beyond product sampling to provide a full service beauty salon. Chase makes its first appearance at Bonnaroo in support of its Chase Freedom products. Cardmembers will have access to an exclusive on-site lounge. Vitamn Water, never a brand for conventionalism, will again host a wireless dance party. Live DJs will spin late into the night, but only be heard by those with wireless headphones - keeping it quiet for the those that don't feel like dancing. Check out the karaoke party below. All of Bonnaroo's 28 partners can be found here.